Description: Brown plastic cuckoo clock deer antlers measure 3-1/4" long from the center of the mounting post to the tip. 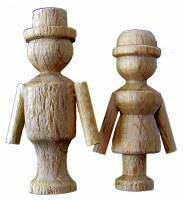 Description: Unfinished wood cuckoo clock couple are 1-3/8" tall. Description: Brown plastic cuckoo clock deer antlers measure 4-1/2" long from the center of the mounting post to the tip. Description: Hand carved wood cuckoo top with birds and leaves. Measures 6-3/4" from end to end. Made in Germany. Stained blonde with walnut brown highlights. Description: Cuckoo clock horn and mouthpiece set is made in Germany. The horn diameter is 28mm (1-1/8"), and the set is unfinished wood. Description: Brown plastic cuckoo clock deer antlers measure 2-1/2" long from the center of the mounting post to the tip. Description: Hand carved wood cuckoo top with birds and leaves. Measures 8-1/4" from end to end. Made in Germany. Stained blonde with walnut brown highlights. Description: Plastic cuckoo clock dancing platform is complete with a plastic mounting base. 2-3/8" in diameter. Made in Germany. Description: Cuckoo clock horn and mouthpiece set is made in Germany. The horn diameter is 35mm (1-3/8"), and the set is unfinished wood. Cuckoo Back Cover 4-1/8" X 4-3/8"
Description: Made in Germany. Walnut stained wood back cover is complete with the appropriate size gong and base. 4-1/8" wide x 4-3/8" tall. Description: Hand carved wood cuckoo top with birds and leaves. Measures 11-1/2" from end to end. Made in Germany. Stained blonde with walnut brown highlights. 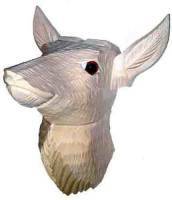 Description: Unfinished hand carved wood cuckoo clock deer head with colored eyes.measures 2-1/2" tall. Made in Germany. Description: Cuckoo clock horn and mouthpiece set is made in Germany. The horn diameter is 42mm (1-5/8"), and the set is unfinished wood. Cuckoo Back Cover 4-3/4" X 5-1/8"
Description: Made in Germany. Walnut stained wood back cover is complete with the appropriate size gong and base. 4-3/4" wide x 5-1/8" tall. Description: Hand carved wood cuckoo top with birds and leaves. Measures 6-3/4" from end to end. Made in Germany. Stained green with walnut brown highlights. 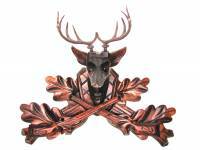 Description: Unfinished hand carved wood cuckoo clock deer head with colored eyes.measures 3-1/2" tall. Made in Germany. Description: Cuckoo clock horn and mouthpiece set is made in Germany. The horn diameter is 55mm (2-3/16"), and the set is unfinished wood. Cuckoo Back Cover 5-1/4" X 5-5/16"
Description: Made in Germany. Walnut stained wood back cover is complete with the appropriate size gong and base. 5-1/4" wide x 5-5/16" tall. Description: Hand carved wood cuckoo top with birds and leaves. Measures 8-1/4" from end to end. Made in Germany. Stained green with walnut brown highlights. Description: 12 pieces of assorted sizes and colors of wood cuckoo clock doors. Cuckoo Back Cover 6" X 6-1/4"
Description: Made in Germany. Walnut stained wood back cover is complete with the appropriate size gong and base. 6" wide x 6-1/4" tall. Description: Hand carved wood cuckoo top with birds and leaves. Measures 10-1/2" from end to end. Made in Germany. Stained green with walnut brown highlights. Description: Cuckoo clock wood door is 3/4" wide x 1" tall and is stained walnut brown. Description: Stamped steel mounting bracket is used to mount cuckoo tops. 3/8" wide x 5/8" long. Description: Cuckoo clock wood door is 3/4" wide x 1" tall and is stained green. Description: Grey and white plastic cuckoo bird has moveable wings. Comes with metal mounting hardware. 3-1/4" Long. Description: Cuckoo clock wood door is 15/16" wide x 1-3/8" tall and is stained walnut brown. Description: Cuckoo clock wood door is 15/16" wide x 1-3/8" tall and is stained green. Description: 1-1/8" long blue and white plastic bird for German novelty clocks. Description: Cuckoo clock wood door is 1-3/16" wide x 1-5/8" tall and is stained walnut brown. Description: Cuckoo clock horn and mouthpiece set is made in Germany. The horn diameter is 28mm (1-1/8"), and the set is stained walnut brown. Description: Cuckoo clock wood door is 1-3/16" wide x 1-5/8" tall and is stained green. Description: Bouncing doll spring for novelty bouncing doll clock movements is 1-3/4" long. Description: Cuckoo clock horn and mouthpiece set is made in Germany. The horn diameter is 35mm (1-3/8"), and the set is stained walnut brown. 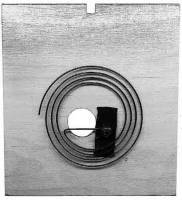 Description: Cuckoo clock wood door is 3/4" wide x 1" tall and is unfinished. Description: Cuckoo clock horn and mouthpiece set is made in Germany. The horn diameter is 42mm (1-5/8"), and the set is stained walnut brown. Description: Cuckoo clock wood door is 15/16" wide x 1-3/8" tall and is unfinished. Description: Cuckoo clock horn and mouthpiece set is made in Germany. The horn diameter is 55mm (2-3/16"), and the set is stained walnut brown. Description: Cuckoo clock wood door is 1-3/16" wide x 1-5/8" tall and is unfinished. Description: Brightly painted plastic cuckoo clock bouncing doll is 2-1/4" tall. Description: Hand carved wood cuckoo top with birds and leaves. Measures 6-3/4" from end to end. Made in Germany. Stained walnut brown. Description: Hand carved wood cuckoo top with birds and leaves. Measures 10-1/2" from end to end. Made in Germany. Unfinished. Description: Hand carved wood cuckoo top with birds and leaves. Measures 11-1/2" from end to end. Made in Germany. Unfinished. Description: Grey and white plastic cuckoo bird has stationary wings. Comes with metal mounting hardware. 3" long. Description: Hand carved wood hunting style cuckoo top with deer head, antlers, rifles and leaves. Measures 14-1/2" from end to end. Made in Germany. Stained walnut brown. Description: 3-5/8" long unfinished wood cuckoo clock bird comes with metal mounting hardware. Description: Hand carved wood hunting style cuckoo top with deer head, antlers, rifles and leaves. Measures 12" from end to end. Made in Germany. Stained walnut brown. Description: Hand carved wood hunting style cuckoo top with deer head, antlers, rifles and leaves. Measures 9-1/2" from end to end. Made in Germany. Stained walnut brown. Description: Hand carved wood cuckoo top with birds and leaves. Measures 6-3/4" from end to end. Made in Germany. Unfinished. Description: Hand carved wood cuckoo top with birds and leaves. Measures 8-1/4" from end to end. Made in Germany. Stained walnut brown. Description: Hand carved wood cuckoo top with birds and leaves. Measures 10-1/2" from end to end. Made in Germany. Stained walnut brown. Description: Hand carved wood cuckoo top with birds and leaves. Measures 11-1/2" from end to end. Made in Germany. Stained walnut brown. Description: Hand carved wood cuckoo top with birds and leaves. Measures 8-1/4" from end to end. Made in Germany. Unfinished.